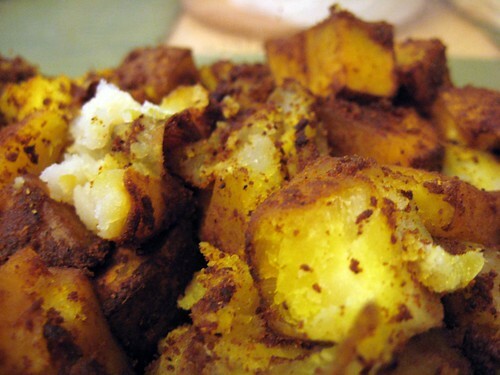 Potatoes with Afritude…Sorta… | Hapa...Shot the Food! Dan: You know, we have some leftover potatoes. We need to cook them soon. I stumbled on AJ’s Disney Food Blog the night before, where I remembered looking at a recipe for one of Boma’s* offerings: Potatoes with Afritude. While I don’t recall having this dish when my brother, sister, and I had breakfast at Boma during our August weekend at Disney (I also am not the best at taking pictures when buffets are involved), and Dan never dined at Boma, it seemed like a simple, tasty, and relatively healthy recipe… It was definitely worth a try. 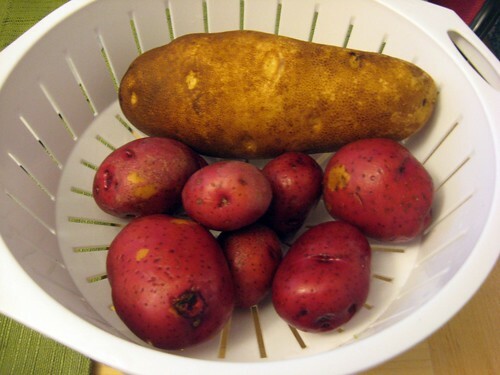 Method: Wash potatoes well, and cut into wedges. In a large bowl mix the spices and olive oil. 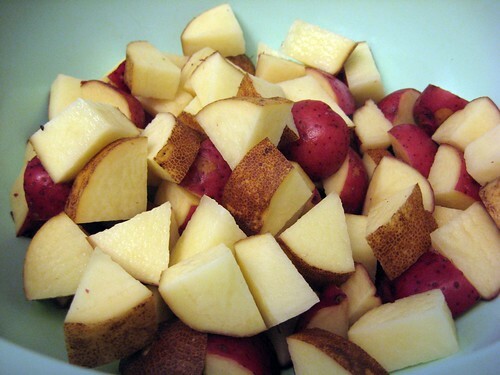 Add the raw potatoes. 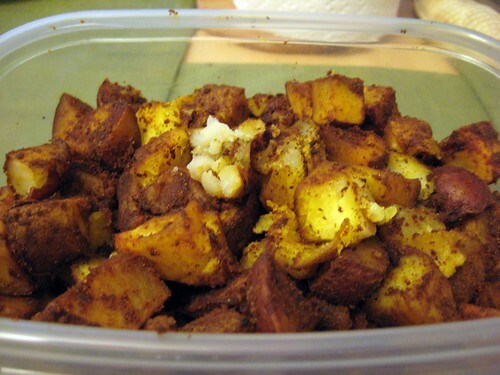 Coat the potatoes with the spice mixture. 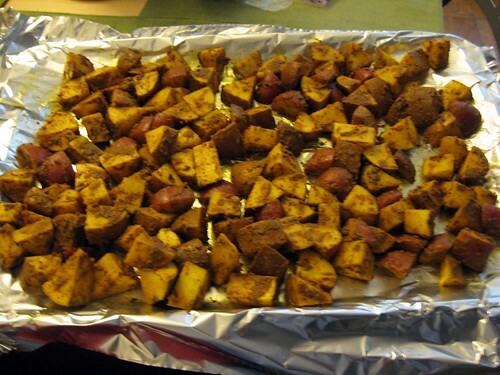 Place the potatoes on a baking sheet, place in a preheated 350 degree oven and bake for 30 minutes. Credit: DisneyRecipes.homestead.com via http://www.disneyfoodblog.com/ . I wedged the potatoes the way I would when I make herbed potato wedges. 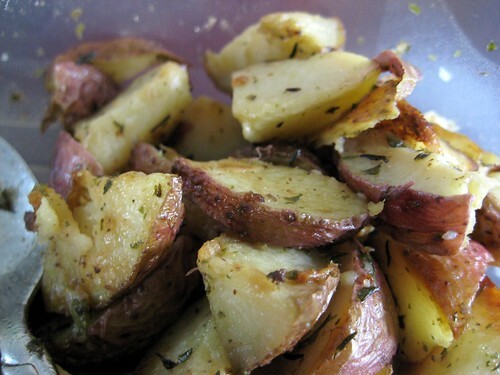 For visual reference: here are the herbed potatoes I was talking about (these are tossed in olive oil, garlic salt, and thyme and/or rosemary before baking at 350 degrees). Back to the potatoes I was making this afternoon: I then added the olive oil and spices like I would have with the aforementioned herbed potatoes. They were then placed in a cookie sheet to bake per the recipe. I ended up cooking them closer to 45 minutes to an hour after mixing them up at the 30 minute point and discovering the reds weren’t quite cooked all the way through. While these potatoes certainly taste like they could come out of Boma and passed the Dan taste test, the finished product definitely didn’t look like the “Potatoes with Afritude” pictures I’d seen on Disney Food Blog or Dining in Disney. Making sure I actually mix the spices and the olive oil separately before adding the potatoes (as the recipe indicates). Either making sure I actually have 5 lbs of potatoes (I had about 2.5-3 lbs on hand between both russets and the reds) or doing a better job at adjusting the proportion of spices. Adding the 1 T. brown sugar to the recipe. *Boma is a buffet-style restaurant in the Animal Kingdom Villas’ Jambo House. 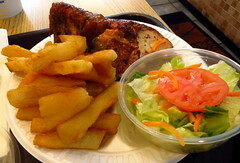 Posted on September 13, 2009, in recipe, side dish, Uncategorized, vegetarian and tagged Boma, Disney, potatoes, Potatoes with Afritude, vegetarian. Bookmark the permalink. 3 Comments. So cool! It was fun to watch your progress through the recipe. Thanks for the “lessons learned” at the end — very helpful!! 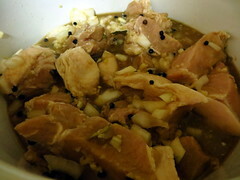 Not a problem… will definitely give you a headsup when I try this recipe again! Neato. Which food show was that, mind if I ask…? 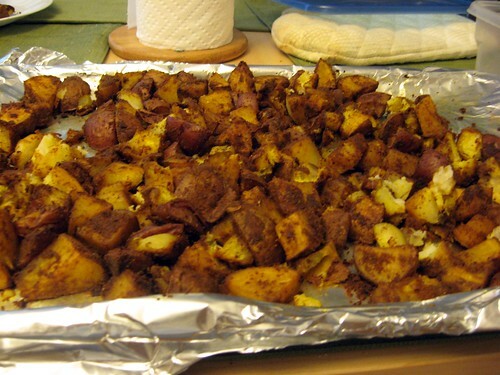 Pingback: Potatoes with Afritude 2: Electric Boogaloo « Sabine…Shot the Food!